The Nissan’s ride is compliant too, not as truck-like or sharp on bumps as some smaller utes and crossovers. Potholes and railroad tracks are minor annoyances, not major events. Braking is fine from four discs and there’s stability and traction control. Where Rogue is lacking is in power. Its 2.5-liter I4 generates 170 horses, and for a 3,545-lb. vehicle that’s sufficient in most city driving. Acceleration though is mild and made more so by the Xtronic automatic CVT. 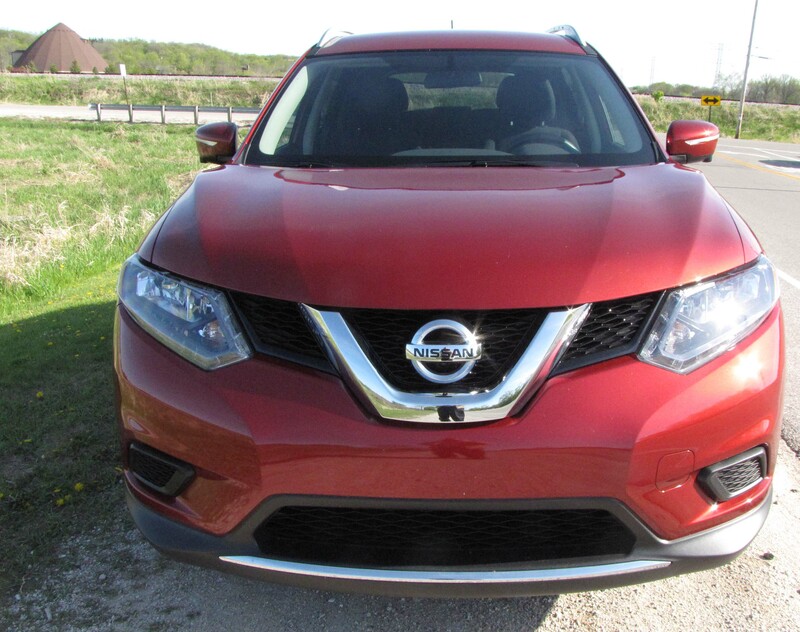 Shifts and acceleration are smooth enough, but there’s precious little low-end power to get the Rogue rolling quickly from a stop or when running up to highway speeds. I mashed the gas pedal a couple times in frustration, wanting more power. A Subaru Forester gives you more low-end power with a similar sized engine and CVT. 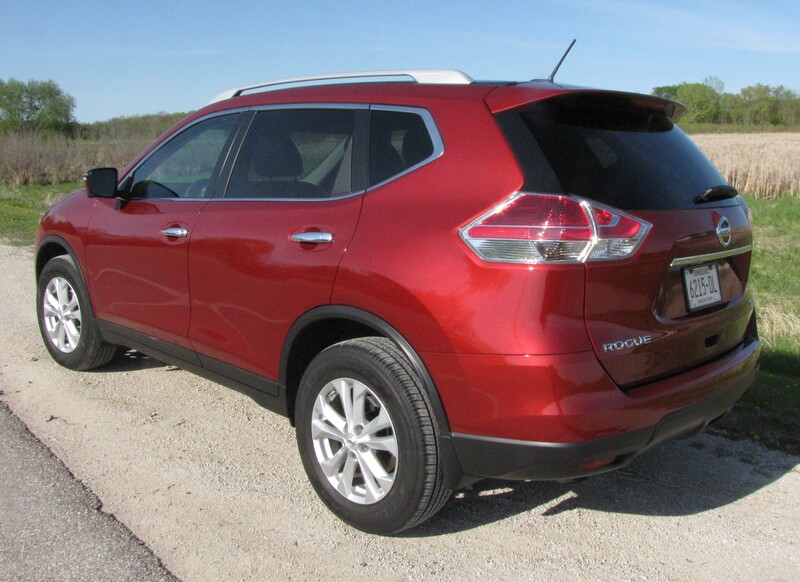 The upside with Rogue, naturally, is good gas mileage. I got 25.0 mpg in about 60% city driving. The EPA says to expect 25 mpg city and 32 mpg highway. That’s good for an AWD crossover or small ute. While the acceleration is disappointing, the interior’s comfort and the added electronic goodies on the test model might be enough to turn many buyers’ heads at this price tag. The SV comes with cloth seats, patterned black in the test vehicle. The rest of the interior is black too with matte charcoal dash and door trim, plus pewter trim on the wheel and around the shifter. The center stack and area around the shifter are gloss black. Rogue’s main gauge pod is easy to read and all the controls on the stack simple to find and use while driving. Climate controls feature big knobs and the off-screen radio buttons are thin, but wide. However the touchscreen channel selection buttons are tiny. A manual tilt/telescope steering wheel is standard with radio, cruise, phone and trip computer buttons on the hub. Seats also are moderately contoured and comfortable. However, being cloth, they tend to be a little harder to slide out of upon exit. 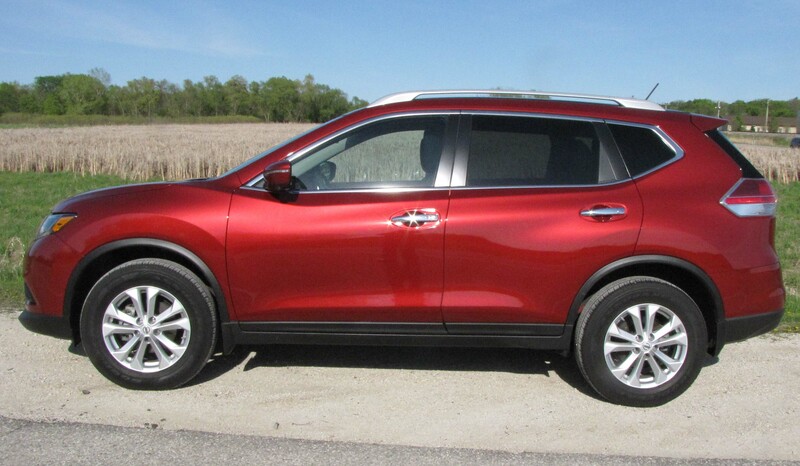 Step-in height is modest on Rogue too while head and legroom are excellent front and rear. A third row seat is optional, but will not offer much legroom. Cargo space is generous behind the second row seat and the test unit featured a split cargo protector ($210) that allows you to store items under its fake floor, a nice little feature for little cost. I like the simple dash in Rogue. I liked the SV premium package too that included a 7-inch color touchscreen, voice recognition for the radio and navigation system, plus SiriusXM travel and traffic info. Better yet, the package adds two-level heated front seats and heated outside mirrors, plus a blind-spot warning system and moving object detection, plus power hatch. A unique Nissan feature in the package is its clever Around View monitor that uses various rearview and sideview cameras to put a composite picture on the screen of what is around the vehicle. That can be handy in tight parking quarters. Package price is $1,590, pretty reasonable for all the techno bits. One thing that this crossover and most others, with the exception of Subaru, could work on, is the side blind spot created by a big A-pillar and outside mirror. This one is pretty large. A few other bennies with Rogue are an inside gas and hood release, plus Sport and Eco modes that you can use at the push of a dash button to give the crossover a little more oomph, or save gas. With this being low on power to begin with, I only tested Eco a couple times. There’s also a big glove box and also an open cubby under the center stack. 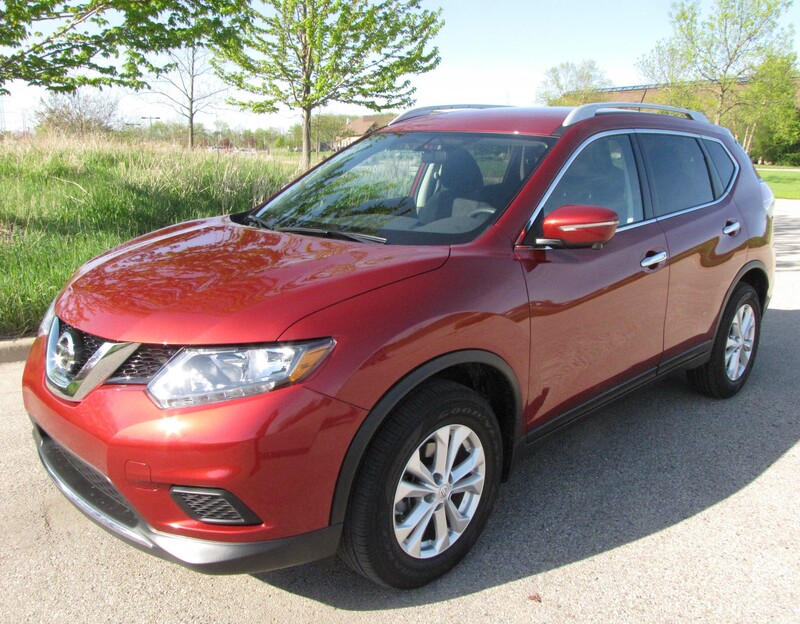 Sun visors slide and the door and center armrests are well padded to add a little luxury feel to Rogue. While this was the mid-level SV, a base front-drive S starts at $23,675, including delivery. Moving up to a CVT automatic moves the cost up to $25,025. Moving all the way up to the SL with AWD puts the price at $30,515. All models have the same 170-horse engine. A V6 is not available. 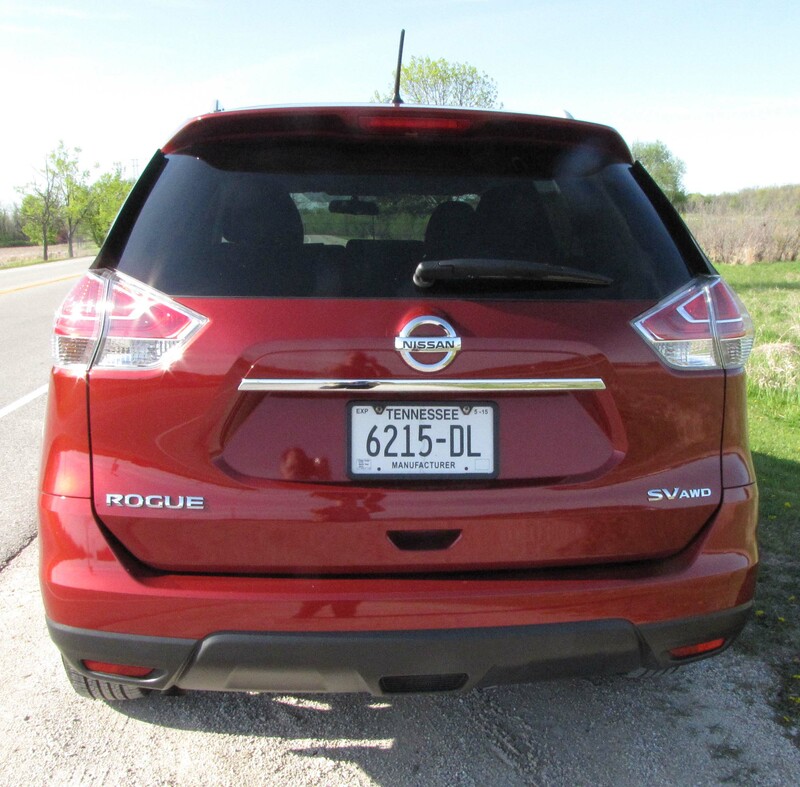 Overall the Rogue SV is a pleasant drive that offers good utility and gas mileage at a modest entry price. Hits: Good handling and ride with AWD. 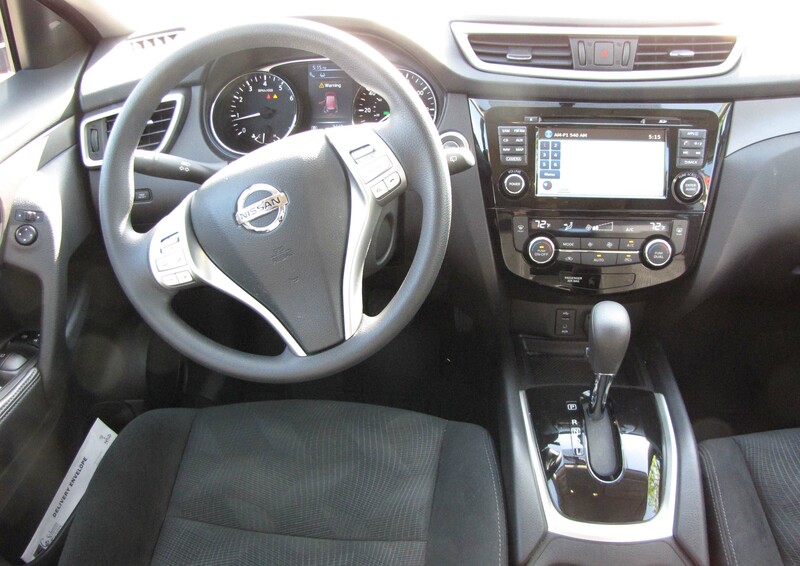 Comfortable interior with good main gauges, blind-spot warning system, 2-level heated seats and power hatch. Good gas mileage. Misses: Low on power, radio has tiny on-screen buttons and there’s a big side blind spot due to A-pillar/mirror combo.